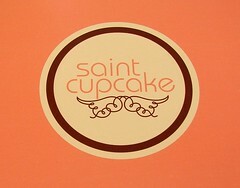 Saint Cupcakes is located in Portland Oregon which is about a 4-5 hour drive for me. So to get my cupcake fix I ordered online using their “fancy cupcake choosing technology”. I ordered 3 different cupcakes, 3 different types of frosting and 3 different types of sprinkles. The ordering experience in itself had me ear to ear. I could hardly wait to receive my $21 order. No, that’s not a typo, people. I paid $21 for just 3 cupcakes. Was it worth it? Well, today was the day. I walked into the office only to see a single ray of light beaming down on a cardboard box. I dropped my purse, squinted at the box and made out the word “cupcake”. I could hear the faint sound of angels singing in the background, “aahhh”. Then reality set back in as I quickly ripped the box to shreds. I was over the top excited! The overall marketing scheme and presentation of the cupcakes was a 10! Brilliant! I honestly don’t know if it could get much cuter than this. The pink box came with individually wrapped cupcakes, tiny containers of frosting, sprinkles and spreading utensils- it’s a full meal deal! Now for the taste test. 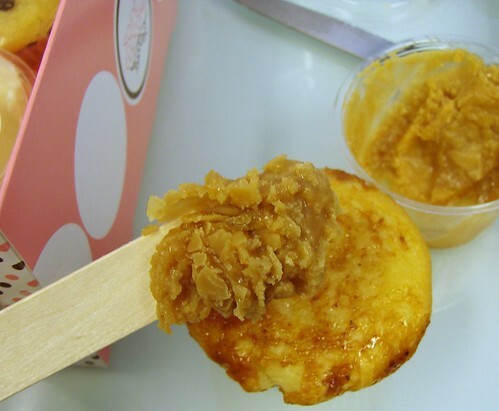 I delicately spread the caramel frosting on the vanilla cupcake. Because the frosting was cold it was tough to spread, but I forged ahead and got the job done. The cupcake was okay …6 out of 10. It wasn’t the best cupcake I’ve EVER had but it did in a pinch. 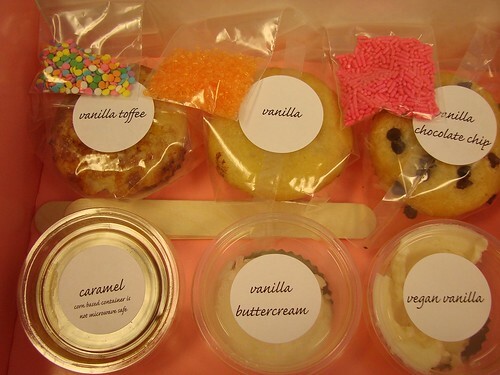 And whatever, the whole unwrapping, cute packaging and action oriented project made up for the so-so oily cupcake. I am still in high spirits with my purchase and I would totally send this as a gift in the future. The whole concept is right on the money. Here I am blissfully tasting the costly treat. Yes, the experience was worth it! Previous Post: It’s Easy! I Swear! Oily cupcake? Uh, not so much. Now you’re making me hungry. I just got some cupcakes from a lady who puts together these kits to make your own cupcakes too at my last craft show! They were so delicious! Sometimes you just have to pamper yourself a little. You look like you enjoyed them! oh, the power of sugar! You’ll know the recession is over when…. cupcakes hit MSN home page! my defunct cuppy cakes are sitting on my garden window like decapitated soliders! It’s a great concept. Sending fragile food in the mail is always a bit tricky, I think. 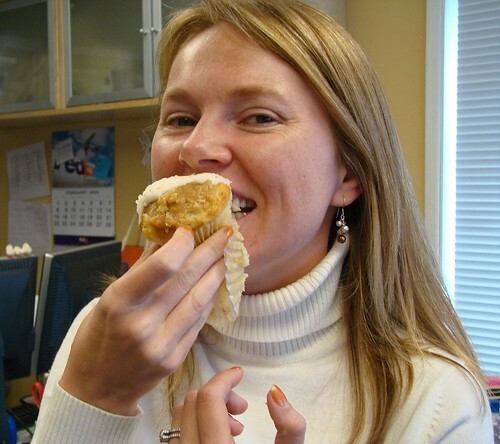 hi cupcake girl….very cute photo of you sampling the $7 cupcake! you asked on my blog how my 09 goals were going. thanks for the reminder….tomorrow is the day we hit the lake track again. Mom’s birthday is coming up and these look perfect and a cupcake for each of us to boot! For $21 I’ll send you a dozen homemade cupcakes from scratch! That sounds like it would be a neat gift and fun. There ordering component on their website is awesome. I like the bangarang bakery’s cupcakes (used to be fatdaddy). She ships them in mason jars, already frosted. They are AMAZING. I’ve tried others on etsy and hers are the BEST! That said, I just ordered some from mickiscountrycandles on the dish, I’ll let you know how they are when they get here. I’m a cupcake freak!